Its true what they say, there is no going back. 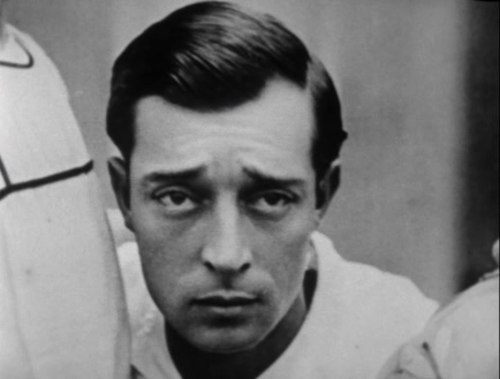 Driving in LA in search of Buster Keaton's Hollywood, I realize that while you may be able to see the exact locations where his films were made -- thanks to the extraordinary research of John Bengtson -- it is impossible to really go there. Time drives relentlessly away from the quaint silent past, and in LA, more than anywhere else, the present is extremely loud and insistent. It just doesn't permit quiet reflection on bygone eras. No, you can't find historic reflections in Venice and you certainly can't find them along Hollywood Boulevard. I didn't even try. Though I had a list of films that were made in and around Cahuenga and Hollywood Blvd and had originally thought we might linger at the intersection in an attempt to spot film locations, the desire to linger anywhere along Hollywood Blvd evaporated as soon as we got there. You may wonder why I kept at it! . . . but, because I was so interested to see the Balboa Island area where Keaton had filmed many of his water scenes (in College, Sherlock Jr., The Cameraman, and The Boat) we went next to check out the (hopefully) idyllic tiny island just off the mainland at Newport Beach. 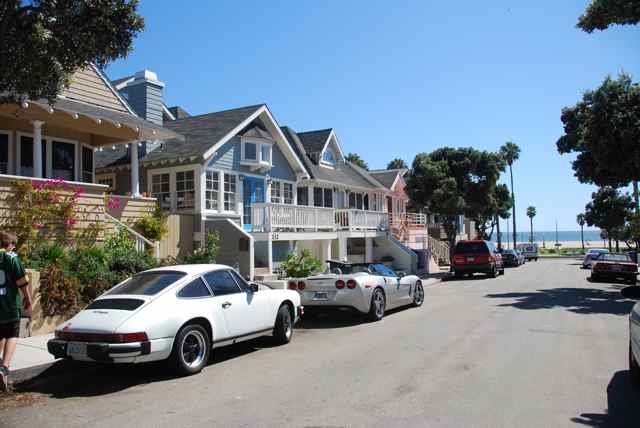 Unfortunately, Balboa Island has to be one of the least peaceful places I've ever been. Every square inch of the 1/4 square mile island is covered with concrete or a house. I literally could not see the ocean for the houses and spent our whole visit simply trying not to hit anything with the car. What I learned through all of this is that "finding" the past through actual film locations is extremely elusive. Luckily, what we found instead was so much better. Just up the road from the actual locations are real sites that are still evocative of Hollywood past. Locations that still seem imbued with a bit of what the 1920s had to offer and that present excellent alternatives to an actual film location tour. I call my tour "Up the Road from the Echoes" and it takes you to the places in LA where you can still pretend it is 1920. Lets start with old Hollywood ambiance. Say you, like many others, want to find Old Hollywood on Hollywood Blvd, the place where dreams were made and maybe you've heard of the Hollywood Museum, billed as the place for early movie fans. Well, if you go, you might be impressed with the huge exhibit on Marilyn Monroe and the weird focus on movie makeup, but, if you are like me, and I hazard a guess you might be, you'll find the depiction of Hollywood in that museum distasteful and jarring. Glitzy, kitschy and seedy scenes meet your eyes under glaring lighting. BUT, just up the street. . . Try the Hollywood Heritage Museum. Here, located on a quiet strip of green grass next to a park and set inside an old wooden barn, you'll find a small slice of history. 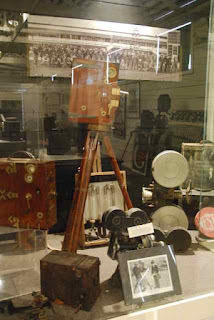 You'll learn about how the first movie crew began shooting the first movie in L.A. on Dec 29, 1913. You can see their photo. You can see two large film projectors that Buster Keaton once owned. 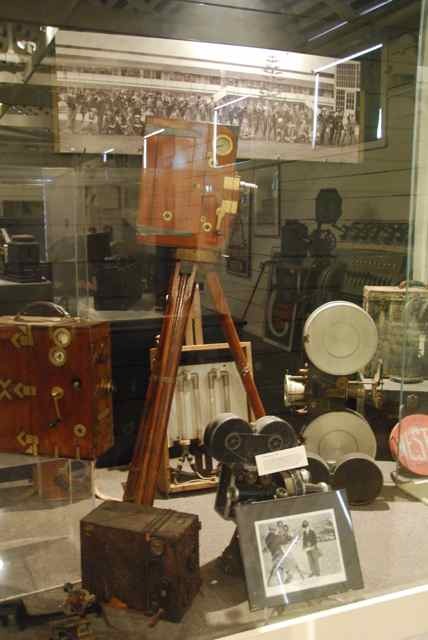 You can see the silent equipment of Charlie Chaplin and a technicolor camera used in Gone With the Wind. Most importantly when you poke around in this museum you won't lose your soul. The place is relatively inexpensive, stocked with excellent books and a variety of old movie titles, smells pleasantly of earth and wood, and time. And while you're in the museum you can revel in your love of old movies and manage to feel intelligent all at the same time. And because you're up and out of Hollywood Blvd you're away from the crowd. The best thing to do is keep going -- maybe keep going into a place called Hollywoodland. There you can visit what was still feels like a sleepy bedroom community. Hollywoodland was the original "Hollywood" of its day. The community that installed the famous sign in 1923 to attract attention and still has a small corner market and a little antique shop with early movie memorabilia. The famous sign is perched in the hills just behind the houses and, though the houses are gorgeous mansions, you won't see throngs of tourists waiting to feel the space, nor hordes of drivers clogging the streets. 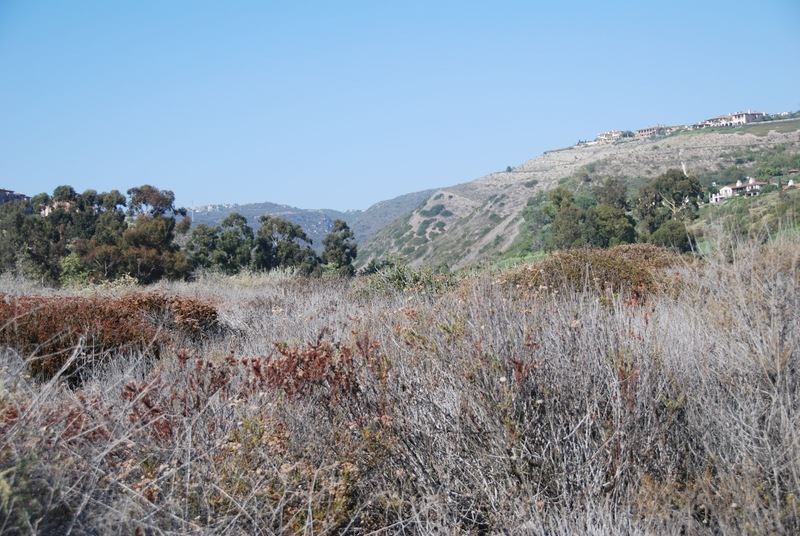 You can feel a slightly quieter hillside development than what you'd get down the road in Beverly Hills and you get to retain your dignity while looking. And speaking of retaining your dignity, a perfect place for that can be found just north a couple of blocks from the absolute anarchy practiced at Venice Beach. Though it may have been a great place for filmmaking in 1922, there is almost evocative of 1922 along Ocean Front Walk now and certainly no reason to go there in search of past reflections. BUT, just up the street . 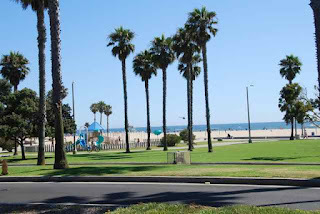 . .
Go a mile and a half north from the heart of Venice Beach. 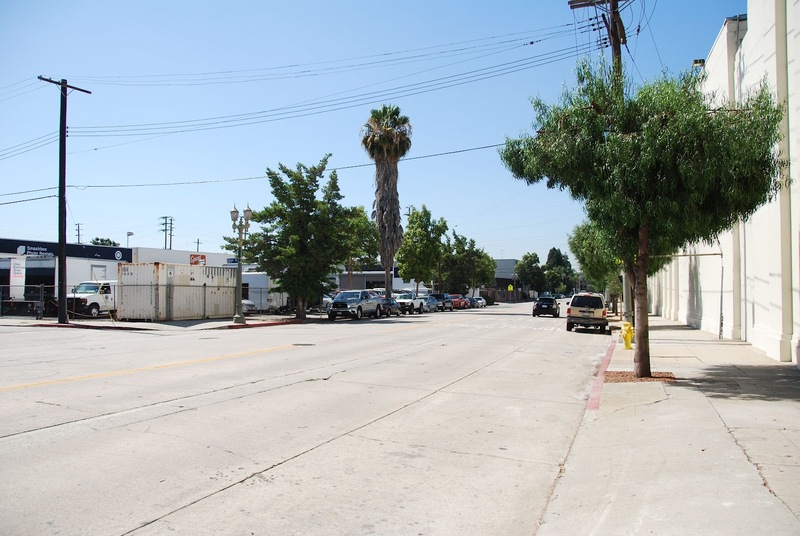 . . maybe to Wadsworth Ave or Hollister or the surrounding couple of blocks. What you'll find might surprise you: rows of lovely, preserved, 1920's era cottages, any of which it is easy to picture Buster Keaton running past fleeing the cops. You'll find a small local park sitting along the beach and your mind can supply the carousel from which he swiped a newspaper from a man. Several park benches line up just paces away and you can see him opening that newspaper to impossible dimensions. Its all just a short distance from where he actually did those things. When you've tired of 1920s era Venice, and want a long car ride down the coast to places where you can find beach memories of the past, just keep right on going past Balboa Island. . . . It's not far. 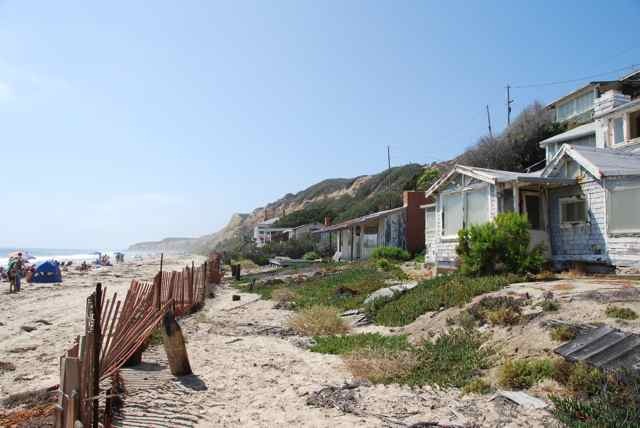 Maybe 5 miles south of where Buster used to shoot water scenes in his movies, you can dive right back in time to Crystal Cove. Here you'll find rows of cottages dating from the 1920s, some occupied by renters at this public beach and some existing in a more natural, time-eroded, state. The beach looks as if it were straight out of a movie. In fact movies were shot here -- if you walk into the little visitor center they'll show you a list. You can quite easily "see" the 20s at this unique and special little beach and when you hike out, notice that the hills on the other side of the highway even have the old-fashioned, brown, undeveloped look that you can picture Buster riding right through on the handlebars of a motorcycle. The old style Hollywood may not be easy to find, but it is there in and around LA, you just have to look a little harder to find it than simply going to the locations where Keaton shot his movies. 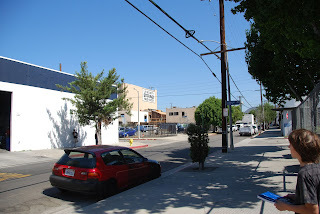 However one place still does exist where the silent echoes are both real and tangible - it is the little area just south of the main drag in Hollywood where Keaton Studios was located. Of course his square block studio was long ago demolished, and of course the surrounding buildings are all gone too, but the area retains an interesting light industrial feel. You're off the main drag; you can park your car and stroll around. It feels safe and pretty quiet. Although you'll see workers, no tourists are milling about. You can hear yourself think. I could totally feel the vibe of Buster running in and around, up and down these streets filming. In fact you can peer in to the lot where his stages would have been. Small-box buildings and out-buildings and light-machinery all sit on site. I found the place entrancing and am thrilled to see that much of the business taking place in the immediate vicinity of Buster's old studio is now movie-related again (prop houses, small studios, other supporting services). There must be a wonderful aura of genius still flooding the area after all these years -- the streets imbued with it. A search for the past can take many forms. Many of us do it right from our living rooms by transporting ourselves into the past through movie magic. Others go in search of remnant buildings, street corners, spots where history occurred. I've found that when the present is too crowded to permit reflections on the past, going just Up the Road From the Echoes you can get a fuller flavor of what time was like "back then." It took a while and an excellent tour guide (thank you to my sister in law for her thorough understanding of the LA area), but I think I found the piece of the past that I was seeking. I'm now ready to go home.